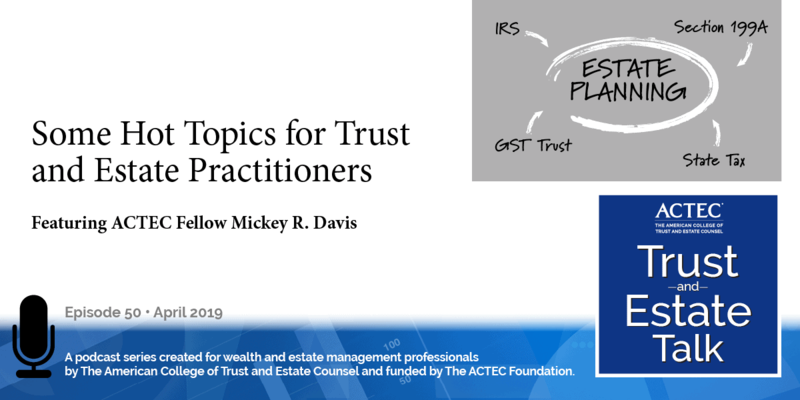 “Hot Topics in Estate Planning.” That’s the subject of today’s ACTEC Trust and Estate Talk. This is Margaret Van Houten, ACTEC Fellow from Des Moines, Iowa. 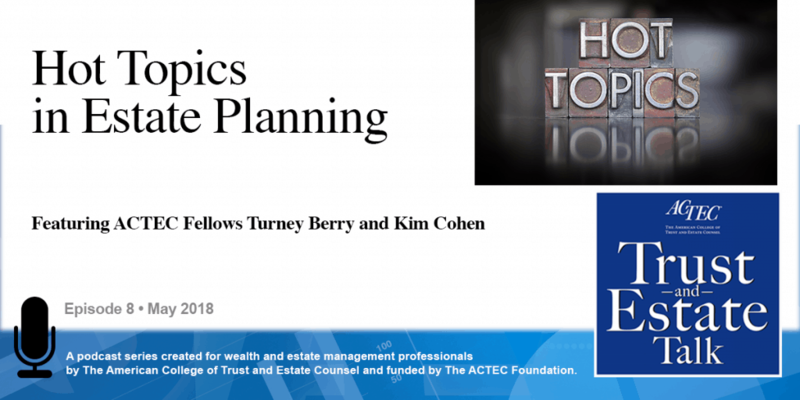 Today, ACTEC Fellows Turney Berry of Louisville, Kentucky, and Kim Cohen of Boston, Massachusetts, will be covering recent developments in the estate planning area. Welcome Kim and Turney. Thank you. So, obviously, I think what is forefront on everyone’s mind is the new Tax Act. And so, certainly we want to talk a little about that, because it’s important, and it’s a very hot topic. 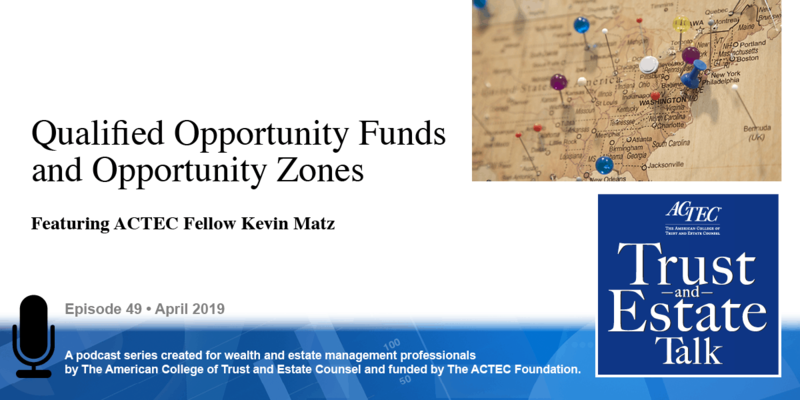 Certainly, the use of the increased exemption is only going to be of interest to certain individuals – very high net worth individuals. So we thought we’d focus on some planning that might be more generally applicable to people. 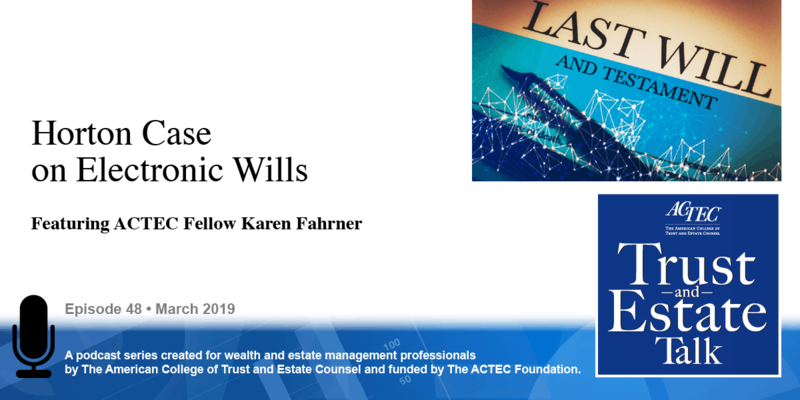 And one of those issues is dealing with marital planning in the estate, and given the increase in the exemption, which is only temporary, how do we think about planning for a married couple at the death of the first spouse? Personally, I think, given the uncertainty in how long this exemption is going to be remaining as high as it is, there’s a lot to say for flexibility and using a single QTIP Trust [Qualified Terminable Interest Property], which allows the executor to make certain elections at the death of the first spouse to take advantage of whatever the tax regime might be in place at the death of the first spouse. Makes these flexibilities very helpful. It’s beneficial for people who might have a state estate tax issue to deal with; it’s beneficial if people don’t have a state estate tax issue to deal with when they create their trust and then happen to move to a different state where that might be applicable, or they might have real property in a state to deal with that has a state estate tax. 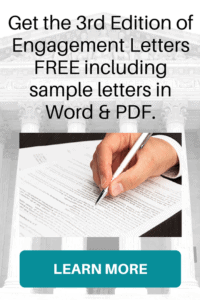 Certainly, we could include language in there that either allows the surviving spouse to disclaim a portion of the interest in a marital trust into a family trust or credit shelter trust for the benefit of the spouse and the children. Or, alternatively, you can use a Clayton QTIP such that if a QTIP election was not made for federal or state purposes that those assets would pass into essentially a family trust, which gives you a lot of flexibility. And it allows you to wait to make any decisions until the first spouse has died, where you have a lot more information. Now certainly, this works very well in a situation in which you have a first marriage and both spouses have children that are both of their children and their interests are aligned. But if you get into situations where you have second marriages and individuals have children from prior relationships and might have competing interests as to how assets are going to pass at the death of the survivor, a single QTIP can become more challenging. Certainly, you can build in limitations around the marital trust, but in those situations, it might be that you choose to use a credit shelter trust. I think one thing that is really important for everybody in thinking about their plans for individuals is to make sure they go back and take a look at whether or not there are any existing formulas in those plans that might not make sense. For example, [for] individuals that have used up most of their GST [Generation-Skipping Transfer] exemption and were providing just for the remaining GST exemption for the inflationary adjustments to go perhaps to an existing GST trust, [it] might not make a lot of sense now that they have an additional $5 million because that might leave the surviving spouse in a very difficult position. So those are a couple things to think about in marital planning under the new regime. I’m going to turn this over to Turney who’s going to talk a little about some basis planning. So, it’s an interesting thing. You have to look at these, but you have a few options, at least we find, that maybe you wouldn’t have thought about some X number of years ago. People come into your office whether they have a taxable estate or not. Let’s first off assume they don’t have a taxable estate. Do they have appreciated assets of some sort? We have lots of people who don’t have taxable estates, they’ve got $10 million; maybe they’re a couple and they’re limping along hand to mouth with a mere $20 million. So, they don’t have a taxable estate right now, but they do actually have a fair amount of appreciation in there – they’ve got stuff, they’ve bought stocks, bonds, land that’s gone up, whatever it is. And the question is, is there a way to get new basis for those assets? And the answer is: Sure, if they have older family members. So, take something very simple, you’ve got a client, the client’s parents or grandparents are living and they’ve got, these clients have $5, $6, $7, $10 million, and grandparents have a million or two, so these all very well-off people. They’re accustomed to getting good advice, taking good advice, but they aren’t in a taxable situation. Why wouldn’t you consider doing something simple like taking assets from your client’s generation and giving them up straight to the parents or the grandparents in trust. Giving the grandparents a general power of appointment; a power to appoint to the creditors of the grandparents’ estate. You don’t really want this power to be exercised and so you conjure up somebody who’s maybe in the family, maybe a friend of your client who’s not going to let the power be exercised; we’ll call him Uncle Fred, who is simply going to say “no” if someone wants to exercise this power. And at death, what happens? One other wrinkle in this plan is that if you give away a $1, $3 million, $5 million in marketable securities some of those are going to go up, some of them are going to sit there, and a few are going to go down. So overall the portfolio will have appreciation, but there will be some losers in there, just luck of the draw. This power can be only over assets that have gone up in value so that you never get a step down in basis. We found that to be very attractive; people are fired up about this. And it seems like it’s something that ought to be considered in the current planning environment.